Have a single-serve coffee brewing system? Now, you can enjoy our coffee-house-quality java at home! Our new single-serve coffee capsules are designed to work with major home brewing systems. Each package contains 10 capsules of our handcrafted coffee in one of four flavors: Armando’s Blend, El Socorro Honduras, Jungle Love and Celtic Grogg. Slightly sweet with a nutty undertone, our signature Armando’s blend combines medium roasted beans from Central America, Indonesia and Africa. Single-origin El Socorro Honduras offers grapefruit-lime acidity, floral and honey notes, a liquor-like body and baker’s chocolate finish. This Friend2Farmer offering supports 21 farmers in the El Socorro Co-op. Jungle Love, a Fair-Trade certified organic blend, combines dark-roasted beans from Central America and Indonesia to create well-balanced flavor, a full body and a long finish. Light-roasted Celtic Grogg coffee beans are flavored with a sweet and creamy blend of caramel, butterscotch, and hazelnut flavors. Our convenient coffee capsules are available in our online store, at Crimson Cup Coffee House, and at select specialty grocers including Weiland’s Market, The Hills Markets and Celebrate Local in Columbus. Environmentally friendly, the capsules are 100 percent recyclable and come packaged in a 100 percent biodegradable bag. 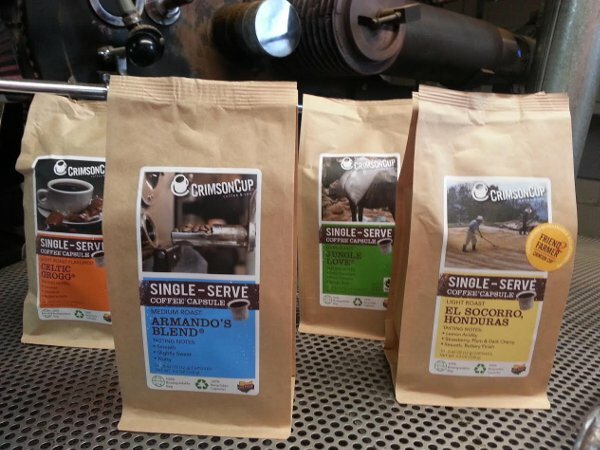 We’ll be adding more handcrafted coffees to our single-serve line in the months ahead. Enjoy!